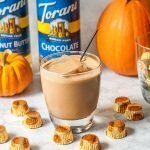 Don't miss out on the Halloween fun with these low carb candy drinks! Only a few ingredients to make these tasty drinks that taste good with our without alcohol. Have fun to create your own. Add all ingredients to a blend and blend until well combined.